Abstract: Fluorescent nucleoside analogues are powerful tools in biophysics, but despite decades of progress, important performance limits of these probes remain. For example, none match the brightness of conventional fluorophores such as Rhodamine B, none emit in the red, and most are quenched in duplex DNA and RNA. The complex relationships between structure and photophysical properties make it very challenging to overcome these limitations using rational design. Towards address these problems, we have used synthetic chemistry to create a family of structurally modified tricyclic cytidine analogues with systematic variance of the electronic nature of the nucleobase analogue fluorophore. The resulting series of analogues has been studied using fluorescence spectroscopy and with DNA and RNA polymerases, revealing a series of trends that relate the structural modifications to fluorescence properties. In this series, we identified patterns relating electronic modification to the color of fluorescence emission and we identified what is now the brightest known fluorescent cytidine analogue. 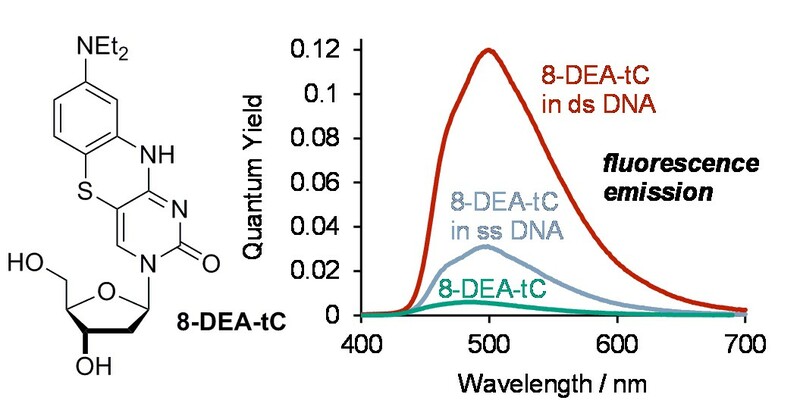 More importantly, our studies of these compounds in duplex DNA revealed that one of the compounds, 8-DEA-tC, has the highly desirable and previously unavailable property of becoming fluorescent only upon the formation of double-stranded DNA with a perfect sequence match. We used solvent effect studies and measurements of solvent isotope effects to show that this fluorescence turn-on property results from the desolvation of 8-DEA-tC in the duplex and from the ability of correct Watson-Crick hydrogen bonding to protect the analogue against excited-state proton transfer, which quenches fluorescence. 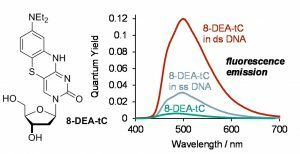 Accordingly, 8-DEA-tC offers the most powerful known fluorescence turn-on capability for directly detecting DNA sequence by a modified nucleoside analogue. By comparing the photophysical properties of this analogue with those having electron-withdrawing groups, patterns are revealed that have the potential to inform the design of the next generation of nucleoside analogue fluorophores with enhanced properties.